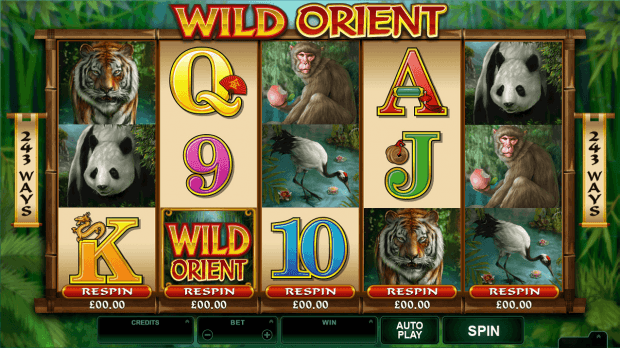 Wild Orient is another MicroGaming slot that uses the very popular 243 ways to win pay line structure. But don’t get Wild Orient confused with other slots you can find at an online casino. 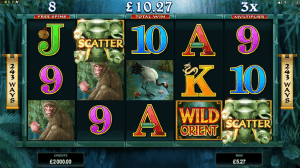 There’s something special and unique awaiting for you in this wild animal inspired slot machine. Aside from the 243 ways to win feature, this slot has one of the most intriguing features you will ever see in a slot. It’s called a re-spin feature. However, this re-spin is not what you might be used to. After any spin, you can choose to re-spin any of the five reels for another shot at winning big. Each re-spin will cost an additional bet. So it’s best used only when you need to finish off a winning combination. Or if you want to try for the 120,000-coin maximum payout. That’s not all Wild Orient has in store. Free spins are won when you get 3 or more scatter symbols anywhere on the reels. 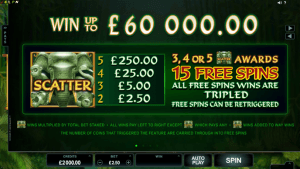 The herd of elephants acts as the scatter and awards 15 free spins, with all wins tripled during this bonus round. The final feature is the Wild Orient slot logo wild symbol that shows up on reels 2 and 4. Wilds replace all symbols except the scatter. If you have played other MicroGaming slots, this slot may look a little familiar. That’s because a few of the animal logos are exact copies of symbols found in two of MicroGamings most popular slots – Untamed Panda, and Untamed Bengal. You will see some symbols unique to Wild Orient such as the Elephant, Monkey and Crane. With a beautiful soundtrack that will mesmerize your senses, this slot is one of the most complete slots you can play. And speaking of playing, this slot can be found any casino online that uses the MicroGaming software. Zodiac Casino and Captains Cooks Casino are just two of the many you can find Wild Orient. Click to play at Zodiac Casino now.